Simply put… where there is racing there is a Porsche. Porsche had 7 models that qualified for homologation. Porsche’s are pretty boring though. Maybe I’ll add details someday.. yawn. Porsche’s 959 supercar was built specifically for the Group B class (the original prototype was called the Gruppe B) and was based on the successful and popular 911. The 959 never competed in the world rally championship, partly because it took some time for the required 200 prototypes to be built, but mainly because Porsche realized the other contenders had an advantage of several years’ development. Jackie Ickx, former factory Porsche driver, convinced Porsche management that the Paris-Dakar rally would be an excellent event to demonstrate the 959’s capabilities, and it would avoid directly competing in the hypercompetitive world rally championship. Porsche ran the 1984 event with three 911s modified to 959 specifications, and came home victorious. 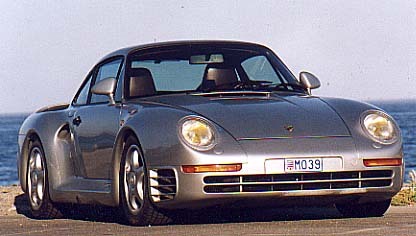 The completed 959s made their first appearance in the Sahara desert in 1985, but it was a year to forget; two 959s were involved in accidents, while the third suffered a broken oil pipe. 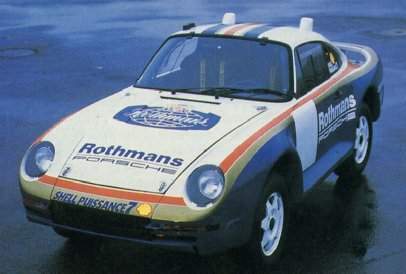 Despite the lack of success, Porsche decided to return for the 1986 event.